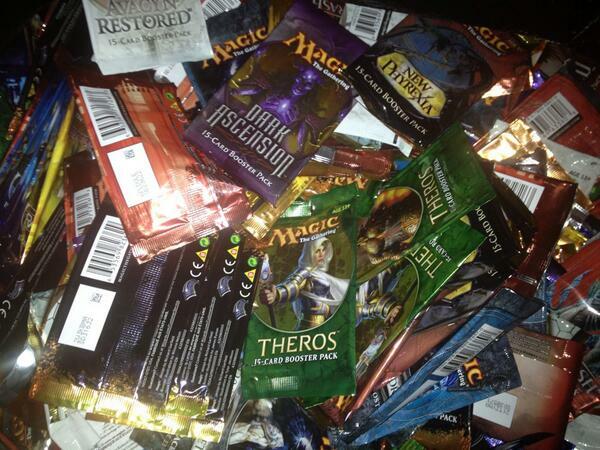 That is actually a picture I took of the booster packs filling up one of those large black plastic trash bags. It fills up about half way. Now, I didn't voluntarily throw these away. That was my girlfriend's idea. Fortunately, she had another idea: Keep one of each art of a booster pack. Of course, this varies for each set with typically 5 for large sets and 3 for small sets, but I don't have a lot of sets from the earlier years, so I had to keep all of them for those (like for Kamigawa block and original Ravnica block, I only opened one pack for each set). Look at the bottom left. It reads 150A3446000003 EN. In all of these, Torment is the first to have one of these numbers, and during this search, I discovered my Apocalypse pack was made in Belgium while other packs I have were made in the US, but as near as I can tell, all the packs after Torment have a serial number that starts with "150" and ends with a number between 1 and 5. Of course, EN indicates the language, which in this case is English, but the others in my collection are CS for Chinese, FR for French, JP for Japan, KR for Korean, and RU for Russian. Also, you may notice the "FABRIQUE AUS ETATS-UNIS." which is French for "Made in the United States" which I can assume is there for anyone in Canada. Looking through, my the Mirrodin Beseiged French pack and the M13 Russian pack were made in Belgium while the other foreign boosters from M13 were made in the US. I'm not sure where the French 4th edition pack was made since it doesn't say, but it may be safe to assume it was made in the US that early. If you know the answer to where the 4th Edition French packs were made, please leave a comment to let everyone else know. I know they did white and black border French for 4th Edition, so maybe that makes a difference. Also, if you have empty booster packs from sets I don't have or art from a set that isn't here, please contact me because I would be interested in obtaining those empty packs. I hope everyone has enjoyed this short trip through some Magic history.